Skerries is an attractive destination for the visiting cruiser due to the proximity of the sailing club and a fine range of restaurants in the harbour area itself. It has good shelter from the East and South and has some shelter from the west. It does not have a marina. The harbour is used by fishing boats but some space is usually available. There is always water at the outer end of the pier. The inner harbour dries out. In all approaches to Skerries by sea great care should be taken to steer well clear of the islands including Red Island due to the rocky foreshores and sandy banks that stretch out from them. Sailing between the mainland and Colt or Shenick Islands is not recommended without very good local knowledge. A good watch should be kept for lobster pots (sometimes with floating ropes) along the coast and between the islands. All approaches to the harbour should leave the perch (red channel mark) to port. The following waypoints are offered only as a guide and should not be used for navigation without checking their suitability for your boat and the prevailing conditions. APPROACHING FROM THE NORTH or NORTH-EAST: Approaches from the north or north-east could use PERCH as a landfall waypoint proceeding from there to HARB. APPROACHING FROM THE EAST: A very useful landfall is the Rockabill Lighthouse, waypoint ROCKBL (not shown on the chart above), proceeding from there to PATRIC-PERCH-HARB. 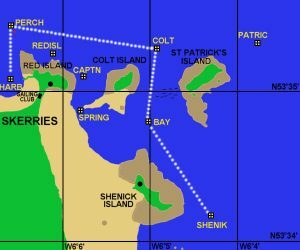 APPROACHING FROM THE SOUTH: The route SHENIK-BAY-COLT-PERCH-HARB gives a safe approach to Skerries Harbour through the islands with a chart-datum clearance of approximately 3 metres. PATRIC provides a turning point enroute to PERCH for those choosing the more relaxed sail outside the islands. There can be some turbulence at the NE corner of St. Patrick’s Island and do watch for pots in this area. To come through the islands coming from the south without GPS: sailing north leave Shenick Island about a quarter mile to port, sail towards the centre of Colt Island when bearing 325T, turning to 007T when the Martello Tower on Shenick lines up with Popeshall Hill behind it on a bearing of 187T. Then about a quarter mile past Colt Island, turn due west to round the Perch buoy leaving it to port. The end of the harbour and anchorage areas should now be visible. Watch out for lobster pots in the approaches. VHF CH72 is usually monitored by those who staff the Skerries punt by day during the sailing season. Contact them and find out about moorings that might be available to suit your boat. Note that Skerries Sailing Club does not have visitor moorings. The use of any moorings is entirely at your own risk. Admiralty Chart 633 for details of depths, navigational aids, suitable anchorages, etc. East & North Coasts of Ireland by the Irish Cruising Club for detailed sailing directions. tying up alongside at the outer extreme of the harbour wall (southerly side). Fender boards recommended. drying out in the inner harbour or beach for bilge keelers and lifting keels. PROVISIONS: several excellent shops in the town centre (0.5 km). RESTAURANTS: Several wonderful eating and drinking locations are ready at hand along the Harbour Road. Those who venture further from the water’s edge into the town itself will find a great range of quality places to dine and drink. BOATS: Of boating interest are the Mermaid dingies that are very popular in Skerries. It is also on record that St. Patrick himself did some boating in Skerries as he frequently went to the outer island to pray. Suitable boating trips from Skerries as a base include Rockabill Lighthouse, Shenick Island (accessible on foot at low tide), Lambay (island), Loughshinny and Balbriggan. SWIMMING: The South Beach provides a gentle sloping beach with lifeguards in the summer. The “Captain’s” on Red Island offers deep-water swimming. The “Springboards” on Red Island has deep-water swimming when the tide is in. Lambay (Island) See Skerries Sea Tours. BUS: A frequent service from the town centre to Dublin and Dublin Airport. See Bus Eireann. TRAIN: Station is 1.5 km from the harbour. Frequent service to Dublin with connections to Belfast via Drogheda. See Irish Rail. Distances not as the crow flies but as the crow sails, avoiding rocks, islands, TSZs, headlands and light-houses!